I LOVE EVERYTHING ABOUT CREATING AND SHARING “Mystery Dancer,” but one of my favorite aspects is the detective work. My husband is amazed by my research skills, and tells me I should work for the NSA. It’s true, I love watching a picture take shape and sharpen as I discover and connect the “dots,” but I think I’ll focus on Ursula for now. While researching her time in Hawaii, I came across a curious if confusing news item in the July 15, 1928 Honolulu Advertiser. Was this news brief from the July 15, 1928 “Honolulu Advertiser” correct? But Ursula was already residing in Honolulu, wasn’t she? I wondered, “Do I have it all wrong? Did Ursula not stay there for a full year? Did she sail home earlier in the year for some reason, and then travel back to Hawaii with her college friend in July?” It seemed unlikely. The preponderance of evidence up to now, gleaned from steamship passenger manifests, news articles and the Honolulu telephone directory, had pointed to her spending 12 straight months in the “Gathering Place” (the Island of Oahu), where Honolulu is located, without returning home. 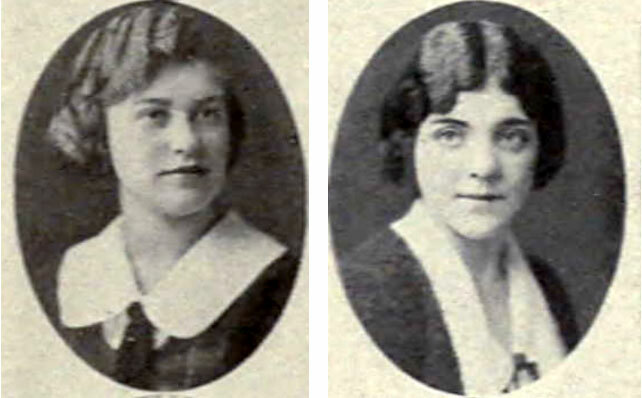 I knew the article was wrong about at least one point: Ursula and Georgia had graduated from UC Berkeley a few years earlier, NOT in 1928 as it stated. Maybe it was wrong about Ursula’s travels, too. I decided to take a closer look. 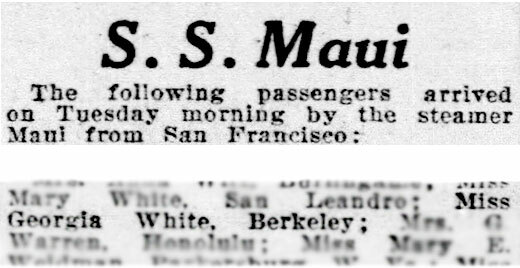 First, in The Honolulu Advertiser’s “Travel-Shipping-Waterfront News” section for June 27, 1928, I found “Miss Georgia White, Berkeley” listed among the passengers who had sailed aboard the S.S. Maui from San Francisco, arriving in Honolulu on June 26. I scoured the list, but Ursula’s name was not on it. Next, on Ancestry.com, I looked up the ship’s passenger manifest for that trip, and sure enough Georgia was listed, but, again, not Ursula. With relief, I concluded that I had been on the right track all along regarding Miss Cheshire’s sunny sojourn. 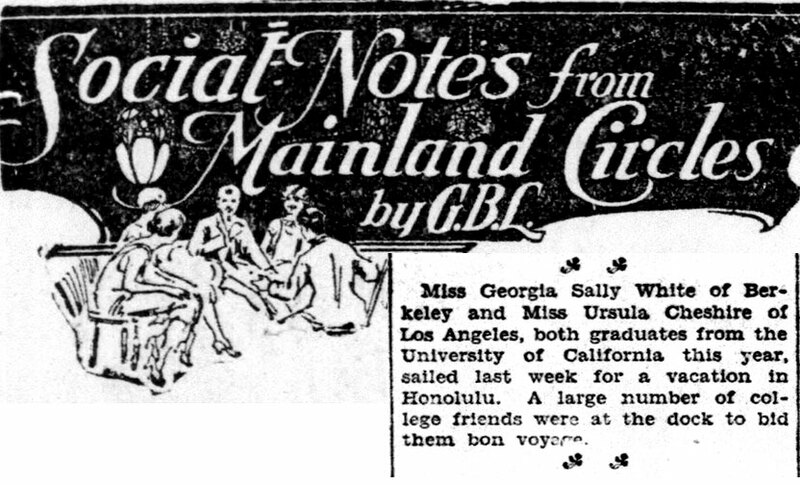 It appears the newspaper had, indeed, gotten it wrong: Georgia was leaving San Francisco on her own to visit her good friend and Zeta Tau Alpha sister Ursula, who’d already settled in Honolulu. No doubt they had a fun reunion, as Ursula and her roommate, Elizabeth, showed their former UC Berkeley classmate the splendors of Honolulu life. A couple of weeks after arriving in Honolulu, Georgia would bid Ursula and Elizabeth adieu and set sail on the S.S. Haleakala, part of the Inter-Island Steam Navigation Co. fleet, for service to the Island of Hawaii. (I learned this from another “Society” news brief in the Advertiser.) There, she was a guest at the Volcano House, where Ursula’s parents and two of her aunts had vacationed 22 years before. Volcano House around 1912. The center section was built in 1891. The hotel was situated on a bluff at the summit of Kilauea, one of the world’s most active volcanoes and home of Pele, the Hawaiian volcano goddess. This hot spot, which has been erupting almost continuously since 1983, was in the news earlier this year, when lava began spewing from new fissures and consuming areas of residential neighborhoods. A version of the Volcano House exists today—you can stay there for around $300 a night, now that the national park it resides in has reopened to the public and the volcano has calmed down. At first I wondered if Ursula had accompanied Georgia to the Big Island. But the report about Georgia’s visit to the Volcano House did not mention Ursula, which I believe it would have if she’d been there, too. Also, the timing was off. The newspaper noted a “Mrs. G.S. White” [whom I am assuming is our MISS G.S.White] among passengers who had sailed from Hilo, Hawaii and arrived back in Honolulu on July 13. But both Ursula and Elizabeth were reported in the “Society” column to have attended a bridge party in Honolulu the previous day—before Georgia got back. We will hear about that social event and more next week. Until then, aloha ‘oe (farewell to you). This entry was posted in Uncategorized and tagged family history, genealogy, Hawaii, mystery dancer, UC Berkeley, ursula cheshire, Volcano House, zeta tau alpha, ZTA by lizross325. Bookmark the permalink.